The Apostle Paul evangelizes Berea at least three times during his ministry. He visited once during his second journey and twice during his third as he traveled back and forth through the Roman province of Macedonia. 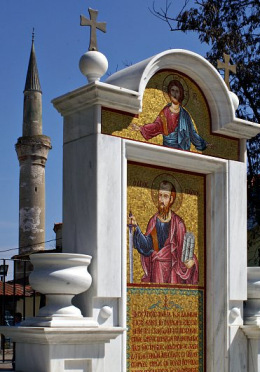 His first visit to Berea was prompted by persecution he, Silas and Timothy (whom he had met just a few months before in Lystra - Acts 16:1) encountered in Thessalonica (17:10, 13). Although the evangelizing of Thessalonica was somewhat successful (17:1 - 9), Jews in the city who were envious of Paul's success at attracting new converts stirred up the people against them. Such actions would eventually lead to his travel to Berea. But the unbelieving Jews became envious and took to them certain evil men of the baser sort; and when they had gathered a huge crowd, they set the city in an uproar . . . Then the brethren immediately sent away by night to Berea both Paul and Silas, who, when they arrived, went into the synagogue of the Jews (Acts 17:5, 10, HBFV throughout). How did Paul use sarcasm to correct? Luke, the writer of Acts, makes special note of the unique mindset of those in Berea and contrasts it with those in Thessalonica. The Bereans possessed a teachable attitude toward the Bible and were willing to spend the time verifying what was taught against the written Scriptures (Jesus overcame a multiple of Satan's temptations by showing they were not right based on the written Word - Luke 4:4, 8, Matthew 4:4, 7, 10). Now these (in Berea) were more noble than those in Thessalonica (which was roughly 50 or so miles, or 80 kilometers, from Berea), for they received the Word with all readiness of mind and examined the Scriptures (the Old Testament) daily to see if these things were so. As a result, a great number of them believed, including not a few of the honorable (upper class) Greek women and men (Acts 17:11 - 12). Concerning the attitude of those in the city and the fruit born by preaching the gospel, Conybeare and Howson state the following. "In a spirit very different from the ignoble violence of the Thessalonian Jews, the Bereans not only listened to the Apostle's arguments, but they examined the Scriptures themselves, to see if those arguments were justified by prophecy. And, feeling the importance of the subject presented to them, they made this scrutiny of their holy books their "daily" occupation. "This was the surest way to come to a strong conviction of the Gospel’s divine origin. Truth sought in this spirit cannot long remain undiscovered. The promise that "they who seek shall find" was fulfilled at Berea; and the Apostle's visit resulted in the conversion of 'many.'" (Life and Epistles of Paul by Conybeare and Howson). Unfortunately, the Apostle Paul's stay in Berea was not long. Thessalonian Jews came to the city, stirred up the people against the apostle, and forced him to go to Athens. Silas and Timothy were left behind to help the new church and eventually meet up with him at Corinth (Acts 17:13 - 15, 18:5). Paul will again visit Berea during a three-month stay in the Macedonia region in late 57 A.D. He will visit the church as he travels to and from Corinth (Acts 20:1 - 3).